Datasets: public and private collections of data files. Structured data that is automatically cleaned, normalized and made easy to understand with context from non-structured data, data dictionaries, summary statistics, and discussions. Data Projects: interactive workspaces for teams to work with multiple datasets at once and answer questions, study hypotheses, and share insights. Connections: SQL and SPARQL query engines capable of connecting data across any number of datasets, a social graph connecting our community members, and integrations to connect the tools you already love to the work you do on data.world. 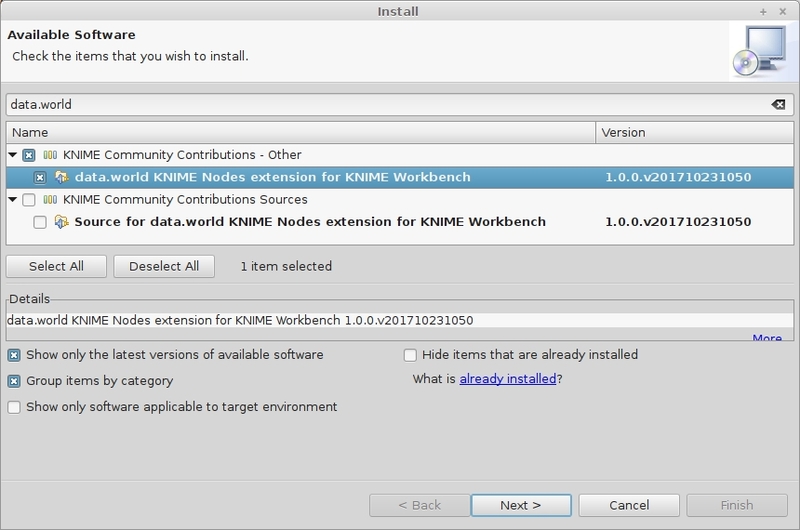 In order to install the data.world extension go to KNIME's preference pages (File → Preferences) and enable the "Stable Community Contributions" update site: On the right choose "Install/Update", then "Available Software Sites".